Providing you the best range of fly ash bricks with effective & timely delivery. Available Color Grey, Black etc. Fly ash refers to the ash produced during combustion of coal. It is the fine powder formed from the mineral matter in coal, consisting of the non-combustible matter in coal plus a small amount of carbon that remains from incomplete combustion. Fly ash is being accumulated as waste material in large quantities near thermal power plants. As the power requirements of the country go up, the amount of waste produced will also increase enormously creating problems for its safe disposal due to lack of adequate disposal facilities. Its use in the manufacture of bricks will be helpful in its disposal and also help in controlling pollution. Dimensional accuracy through the uniform shape. No emission of greenhouse gases during production. Consume less mortar in construction. 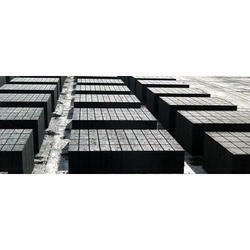 Our offering range of Fly ash bricks are eco- friendly products. When compared to the red bricks we can save nearly 20% of the total construction cost. These Fly Ash Bricks are manufacturing by Hydraulic Pressure Machine, so you can get the proper edges and the proper standard dimensions.